Wave is the perfect hybrid of a major event space and your favorite neighborhood bar in downtown Wichita. Serving as a social oasis and a multimedia venue, this newly built indoor/outdoor spot can meet your needs whether you’re looking for a space to accommodate up to 3,300 or a hangout to recommend to attendees. In its first three months, the downtown event venue has drawn crowds for lunchtime jams, after-work parties, indoor farmers markets, concerts and festivals. It can hold 500 inside and as many as 3,300 outside. They’ve created an all-season backyard vibe with comfortable lounge areas, a craft beer garden, yard games, live music and an in-house BBQ kitchen along with a rotating lineup of food trucks. One of the forces behind Wave is Adam Hartke, whose vision for a thriving music scene in Wichita has helped change the tune of downtown. Through his work with major Wichita venues, festivals and now Wave, he regularly books national acts and creates opportunities for local musicians and, in turn, concertgoers. For an event or everyday relaxation, Wave’s atmosphere is unforgettable. 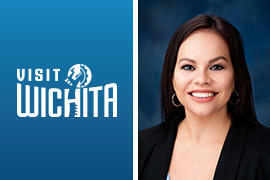 Jessica Viramontezhas joined Visit Wichita as a convention sales manager, focusing on the areas of aerospace/aviation, government/military (non-reunion), environmental, engineering and scientific, legal, finance and energy. Viramontez was born and raised in Wichita. She earned a degree at Wichita State University and most recently worked in Kansas City. “I moved away for a couple of years and recently moved back home, which has given me an even greater appreciation for Wichita. The changes that have taken place and the resurgence in city pride are inspiring,” she said. Jessica joins a sales team, led by Vice President of Sales Moji Rosson, that consists of three convention sales managers, a convention services manager and a convention sales coordinator. For more information, meet our sales team. Wichita has hit a bullseye, landing one of the hottest trends in group activities. Axe-throwing bar Blade & Timber recently opened and its location in the Historic Delano District is fitting. In the 1870s, Delano was the rowdy area at the end of the Chisholm Trail where cowboys could get a drink and have some fun across the river from Wichita and its ordinances. Blade & Timber can comfortably accommodate groups of 80 to 100 people. Any of its nine lanes can be rented, as well as the entire facility. They provide all the equipment and offer bar service. Catering is available from tasty Delano restaurants. Patrons won’t want to miss the mural on the exterior of the building. It features the popular Wichita flag and Carry Nation, the infamous prohibitionist who fought against liquor with a hatchet in the early 20th century, just a few miles down the street. In the past few years, the Wichita community has celebrated big wins and increased pride. This positive momentum has driven people to ask, “What’s next for our region and our community?” This year, citizens have been working to answer that through Project Wichita, a community engagement process to create a vision and a 10-year action plan. We’re in the final stage of the three-phrase process that includes listen, focus and share. Citizens responded in overwhelming numbers in the listen phase, which was facilitated by Wichita State University&apos;s Public Policy and Management Center. More than 90 organizations committed to help shepherd and fund the process. 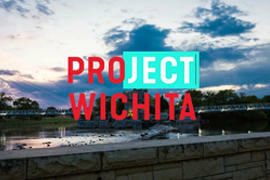 Based on community input, Project Wichita created this vision statement: Here in the heart of the heartland, we work together to create a vibrant region where people choose to live because we bravely seize opportunities and champion change, provide pathways to success, welcome our differences and invest in our future. Five focus areas also were identified that the action plans will address: quality of place, strong communities and neighborhoods, economic prosperity, talent and lifelong learning. Those action plans containing strategic steps for the future of our home are expected to be shared by the end of the year. 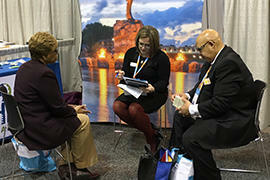 Dec. 11-12: Association Forum Holiday Showcase, Chicago, Ill.
Dec. 12-13: Kansas Society of Association Executives Conference & Expo, Topeka, Kan.
Jan. 6-9: Professional Convention Management Association Convening Leaders, Pittsburgh, Pa.
Jan. 29-31: Religious Conference Management Association Emerge, Greensboro, N.C.